The conference will bring together experts in upper airway microbiology with an emphasis in the nasal/sinus cavities, larynx and trachea to advance and integrate knowledge of the upper airway microbiome in health and disease. Continue reading"Upper Airway Microbiome: Principles for Mucosal Biology in Health and Disease"
This project will define the microbial processes and species responsible for oxidation of ferrous iron (where the iron ion shares two of its electrons) and consequent weathering of iron-containing mineral aggregates. This project will help researchers understand how the susceptibility of a plant host affects its microbiome and identify ways that the plant microbiome can be measured and manipulated to improve food safety and agricultural sustainability. Continue reading"The Tomato Microbiome in Sickness and in Health"
The project will develop an effective set of computational and experimental tools that can quantify and predict the concentration and turnover rates of intracellular and extracellular metabolites (i.e. fluxes) in microbial communities. Continue reading"Harnessing Microbiomes for Global Nitrogen Cycle Management"
This study, Examining the Potential of the Microbiome in Children to Reduce Antibiotic Resistance (EPIC) will examine the impact of daycare on a child’s microbiome and risk of infection with drug-resistant pathogens. Continue reading"Examining the Potential of the Microbiome in Children to Reduce Antibiotic Resistance: the EPIC Study"
This project will create the Population-based Microbiome Research Core (PMRC) in the Survey of Health of Wisconsin (SHOW). Continue reading"Establishment of a Population-based Microbiome Research Core in the Survey of The Health of Wisconsin"
This project will examine ecological interactions and environmental factors that influence butyrate production in the gut microbiome. Continue reading"Developing Model-Guided Frameworks to Dissect Butyrate Production in the Human Gut Microbiota"
This research will test whether Alzheimer’s disease is caused, or at least influenced, by the gut microbiome. 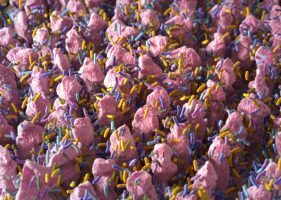 Continue reading"Contributions of Gut Microbes to Alzheimer’s Disease"
This project funds creation of a germ-free facility that will provide services for the whole UW-Madison community. It proposes a partnership with Laboratory Animal Research (LAR) within the School of Medicine and Public Health to build and manage a facility that meets the needs of the campus. Continue reading"A Germ-free Mouse Facility for the UW–Madison Community"
This project will fund development of a soil “Microbiotron” — a modular system of 48 soil-plant incubation chambers, each individually instrumented and controlled by a centralized system. Continue reading"The UW–Madison Microbiotron: A Modular Experimental Platform to Crack Open the Plant Soil Microbial Black Box"
This project funds research to look at asymptomatic infection with the parasite Toxoplasma gondii, which occurs in about 33 percent of the world’s population (but used to occur in nearly 100 percent. Toxoplasma results in fat malabsorption and reduced weight gain irrespective of diet. Continue reading"Gut Brain Communication: How a Resident Microbe in the Brain Prevents Weight Gain in Animals Fed a High Fat Diet"
The Microbiome Hub will provide the means for researchers in diverse fields at UW-Madison, who have no training in microbiology or bioinformatics, to routinely examine the microbiome in their studies. Continue reading"The Microbiome Hub: Enabling a Biological Revolution at UW–Madison"
Comparing “germ free” and colonized mice on defined diets, this project will explore how gut microbes alter the levels of circulating metabolites, specifically essential nutrient choline, and how these dynamic metabolites alter the host’s epigenome. Continue reading"Gut Microbial Metabolism and Host Epigenetic States"